The first three days of the camp, called the Multi-Specialty Medical Camp, are held in conjunction with Max India Foundation. It has won many awards for its Corporate Social Responsibility, which focuses on healthcare for the underprivileged. Its CEO, Mohini Daljeet Singh, has come each year to Bodh Gaya to oversee the camp and meet with the Karmapa. Among the large network of Max Hospitals in India, this year she sent out a request to the Max Hospital in east Delhi, and six doctors responded with the wish to participate. Many of them had already staffed in free clinics in the Delhi area and their specialties covered pediatrics, internal medicine, family medicine, and general surgery. 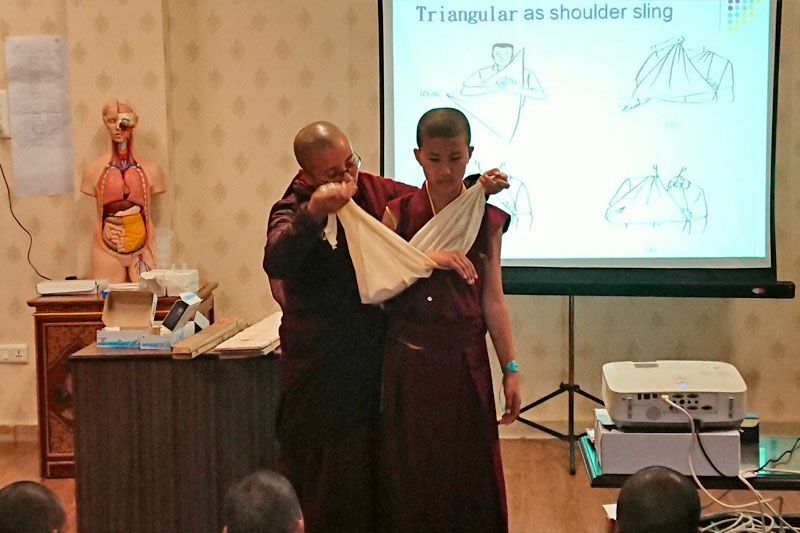 Also participating in the camp are three Tibetan women doctors trained in allopathic medicine from Sikkim, and eight Tibetan nurses from Delhi and Sikkim, who are followers of the Karmapa. Finally and importantly, there are two senior doctors from the local Gaya Medical College, who will help during the camp and also with the people who need follow-up care. 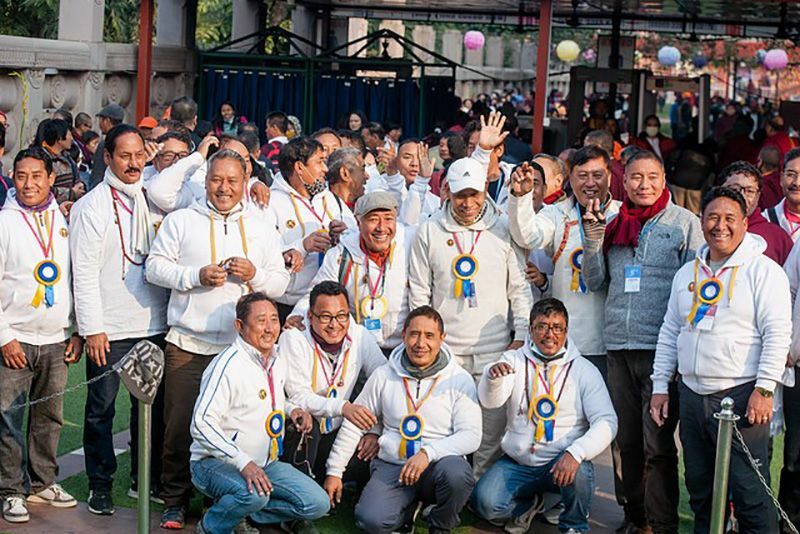 Near the Monlam Pavilion, easily accessible to the participants is the Tibetan Medical Camp, where Tibetan medical doctors provide free diagnosis and medicines as well as two Tibetan physiotherapists offering their services. In total, there are fifty people volunteering at the camps this year. 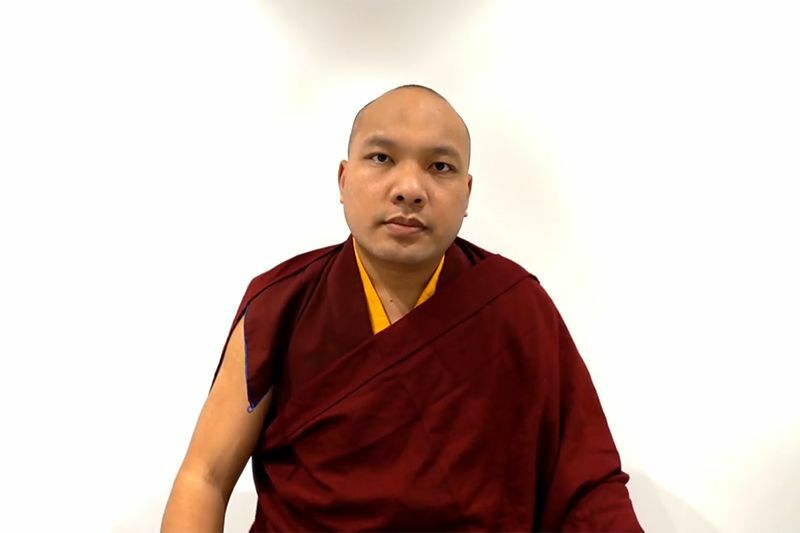 From the Karmapa’s Office of Administration, Lhakpa Tsering for many years now has been organizing the camp, which this time extends from February 14 to 18. The day starts at 9 am and finishes around 5 pm or when all the patients have been taken care of. 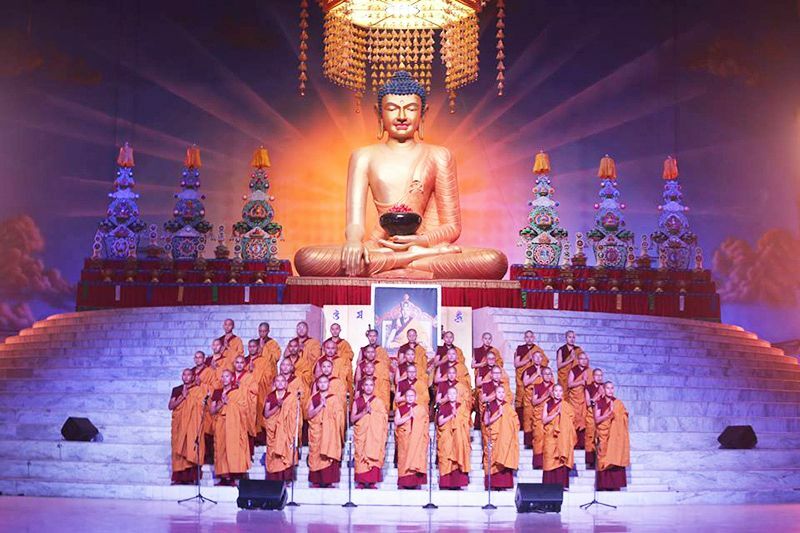 To let people know about the camp, for days beforehand a vehicle with a recorded announcement has circulated through Bodh Gaya and the surrounding ten villages and leaflets in Hindi have been distributed in a five-kilometer radius. Each year, Lhakpa Tsering explained, they have tried to develop their services and add value to what they are doing. This year, in addition to diagnosis, counseling, free medicine, and hospital referrals, they have added the awareness of preventative measures people can take to improve their health. The nurses have prepared presentations in Hindi, and in the main hall where the camp takes place, short movies are continually shown, covering topics such as the dangers of smoking, the importance of hand-washing, breast cancer and TB awareness as well as how to prevent malaria, hepatitis, and typhoid. Also new this year is free diagnostic testing on the advice of the doctors. On this first day of the camp, some 100 people have arrived in the morning on a large white bus. Separated into lines of men and women, who often have children in their arms or by their sides, they are lined up in front of a long table where three nurses take their initial information. The patients range in age from two to ninety-one. Afterward they move inside to have their vital signs taken and then watch the informative films while waiting see a doctor. On this first day 600 people received medical care, and that number or more are expected for the remaining days. Late in the morning the Karmapa arrived to tour the facilities and meet the staff. He was welcomed by Mohini Singh and Lhakpa Tsering, and invited inside to see the pharmacy and meet the staff. 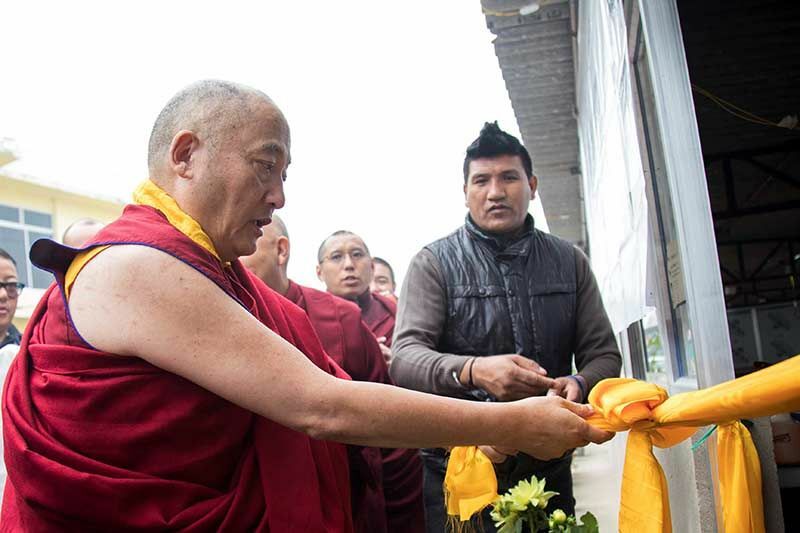 He entered each of the four offices, greeted all the doctors, and then walked across the street to visit the Akong Tulku Rinpoche Memorial Soup Kitchen, located at a Buddhist monastery near the medical camp, so that patients waiting to return home can have a meal. (**) The head monk greeted the Karmapa and they walked together to the outdoor shrine with a lovely statue of the Buddha to whom the Karmapa offered a white scarf. He then proceeded to view the kitchen, peering into the bags of cabbages and carrots and greeting the workers, before posing for a group photo with all the volunteers. With the Karmapa’s presence and blessing, there was a feeling of quiet joy that the camp had gotten off to a wonderful start.